Discussion in 'Contrails and Chemtrails' started by Mick West, Apr 1, 2018. Their readings obviously go wrong below 280 nm. Herndon's answer to this problem is that his cheap device is right and NASA's satellite measurements for the last couple of decades are wrong. We demonstrate that LISIRD solar spectra irradiance at the top of the atmosphere is badly flawed with some regions of the spectrum being less intense than measured at Earth’s surface. That calls into question any calculations made utilizing LISIRD data. I'm interested in the use of the ILT950UV for measuring UV-C solar radiation. I see in this recent article: http://www.journalrepository.org/media/journals/JGEESI_42/2018/Mar/Herndon1422018JGEESI40245.pdf that a ILT950UV was used over the range 200-400nm. However it demonstrate an unexpected upwards curve below about 260nm (see Fig 3) where the expected UV from sunlight would be near zero. Is this result a problem with the ILT950UV at the lower range, or an issue with calibration or filtering? Thank you for your interest in our ILT950. All CCD array spectrometers are prone to effects of stray light in the UVC. The CCD is made of silicon which is very insensitive in the UVC, so it has a large calibration factor multiplier which magnifies the small levels of stray light reaching the pixels used to measure UVC. Basically the error starts as stray light but then during conversion from pixel to irradiance the calibration multiplier increases the error of the stray light. I also noticed that the graph is plotted in log scale which tends to magnify smaller numbers. Thought our new model ILT950 with a CMOS sensor has more UV sensitivity as compared to the Visible range it will still suffer the effects of stray light. The only way to truly measure very small UV signals in the [presence] of very intense white light is with a monochromator, or possibly even a double monochromator which cost in the 15-25,000 dollar range. So the rise in UV at the bottom of the range is due to the multiplication of noise from stray sunlight multiplied by a function that ramps up for low values of UV. i.e. it's a graph of the correction function made visible by not filtering out all the other light. So the curve seen there is essentially stray light multiplied by calibration multiplier? i.e. the shape of the curve actually reflects the function used to calculate the calibration multiplier? ILT say the only way to measure UV-C with this instrument is monochromator. This is a type of specialized filter that blocks out all stray light outside of one narrowly defined part of the spectrum. This was not done by Herndon, et. al, which is why they have the peak in UV-C. It's simply the calibration curve added in by the software. No UV-C was detected. Authors have measured solar irradiance spectrum in the spectral range 200- 400 nm. This study is flawed in its physical component. The UV-C measurements are not credible because they were obtained with an inappropriate instrument and they do not agree with theoretical predictions (Planck’s law - blackbody emission). I suspect these UV-C fluxes to be spurious results of instrument limitations. The impact of stray light correction on the spectrum of a calibration source is particularly distinct in the UV and IR spectral range, because the detector of an array spectroradiometer has only a low sensitivity at the edges. Due to the division of the measured spectrum by the reference spectrum, errors due to stray light contaminated measurement spectra are intensified in the areas of lower sensitivity. Thus, stray light correction leads directly to a higher precision in radiometric evaluations of UV LEDs. Notice the most accurate readings (green) with the scanning double monochromator (as suggested by ILT) are around 0.001. Basically zero. Herndon, et. al, do mention "stray light"
This is a new line of investigation employing International Light Technologies ILT950UV Spectral Radiometer with fractional nanometer resolution in the short-wavelength portion of the ultraviolet (UV) spectrum with stray light rejection >99.7%. What they fail to realize is that 0.3% of very bright sunlight is still a lot of stray light falling on the UV-C portion of the sensor. Here's his problem in a bit more context. The larger blue graph is the actual solar radiation spectrum measured in space. Red and black are his measurements. Above 280 they are quote reasonable, being lower than the raw values above the atmosphere. The also (correctly) drop to zero at around 280. Then at around 250 down to 200 his readings ramp up to 20x times the value found in direct sunlight in space. UV data in the 200-400 range comes from the $122 Million SORCE satellite. Similar errors were early reported on Geoengineering watch. The August 5th, 2017, UV metering graph below reveals the increasing spikes of ever more lethal UV radiation spectrums. The ozone destruction / UV radiation increase equation is extremely non-linear, this fact must be remembered and considered. Below is a direct quote from a World Health Organization (WHO) publication on UV radiation, the total denial of UV-C radiation reaching the surface of Earth is nothing less than a lethal lie. Again this just looks like sensor noise. They should see how the sensor responds in this range in A) darkness and B) indoor artificial bright light. Very reasonable explanation. Had Herndon (or his co-author Raymond Hoisington who was responsible for the spectral measurements) consulted the manufacturer, they would have saved themselves from an embarrassing mistake. But Herndon will never accept this. "A new warning of deadly ozone layer collapse from a former NASA engineer"
This author has confronted a major scientist with the NASA "SORCE" program, and the subject of 270 nanometer radiation levels measured at earth surface were discussed – that scientist responded by saying “your data is a result of stray light, UVC radiation is attenuated completely by the Upper Ozone Layer and the atmosphere”. This scientist denied the data presented through emails, and all phone and internet communication was terminated with the author. Had Herndon (or his co-author Raymond Hoisington who was responsible for the spectral measurements) consulted the manufacturer, they would have saved themselves from an embarrassing mistake. According to the above paper he did.
" The initial order to International Light Technologies specified that solar radiation measurements were to be performed with this unit, and that power levels to be measured in μW/cm²/nm. International Light Technologies provided all training, and feedback analysis of initial data gathered to insure correct measurement process"
At face value, that would suggest that ILT have represented one thing to the authors, and another to Mick. However, in this technical paper, the authors disclaim that their technical competence and the reliability of interpretation of their data is/was subject to the prior interpretative/confirming work of others. Further, the results of the authors’ work is of ground-breaking significance. In such a case, would it not have been appropriate that the authors would disclose the details of the “initial data” and the “feedback analysis” for the purposes of ensuring their work could be tested and repeated? In the circumstances, I suggest that the onus falls on the authors, not ILT, to disclose that information. Ah, handheld spectrometers are great! But not at 350nm and lower.. It is well known fact, if they would have the experience using them or any photometric device.. The authors should have asked a photonics engineer first, smh..
(Para 2 of the Introduction of their paper). So I would be very surprised if they felt that ANY other engineer could be trusted to give them impartial advice, particularly where it would have the effect of rendering their entire paper irrelevant. The paper explains a lot, but just not enough information is given about how the system works and if they (the operators) took care enough to prevent wrong data. The type of instrument they used is used everywhere, in labs and in the field. As I have used these type of spectrometers extensively in labs (I used OceanOptics USB4000), consists of a compact or "folded" optical design, where a small concave mirror is re-imaging the entrance slit via a small grating on a small CCD line-detector (8pix x 1064). 1-The spectrometer should have a "grating order cut off filter" inside. This is an optical filter, cutting off higher wavelengths than the range the unit measures. This is needed as the (sun) light is very much brighter around 700nm, a wavelength range that still enters the spectrometer and is diffracted by the grating. It will not directly hit the detector, but hit somewhere inside a (black) baffle of a wall. There the problem occurs: the light is scattered inside the unit and the scattering will hit the detector. When this is not taken in account observing the results, it gives a false result. 2-Operation of the software might be wrong. The software has different settings for acquiring data: Absolute or Relative. When the Relative tab is used, the measured data is continuously referenced the the REF data taken earlier. This ratio is a tricky thing: if an angle is changed or the sun has moved somewhat it will immediately result in curves. The UV detectivity of Silicon also is very very low, and therefore a lot of "tricks" are needed to still spectrally observe UV light. Another fact is that the CCD arrays will not give you a larger dynamic range than ±12 bits. It think this is perhaps a case where we need to be careful not to understate both the implication of their claim and and the errors in their evidence. Red&Black is theirs, green is the reference level of incoming solar radiation in space. They show what is now obvious is the calibration magnification of stray light in the range from 250 nm down to 200nm. This is increasing to 20 as the levels in space, with no filtering, direct from the sun, decrease down to less that 1. So even if there was no ozone, as they suggest, then the UV would start going down (even more than it does in space), not up, at 200. AND, if there was no ozone, then where is the UV between 250 and 300? 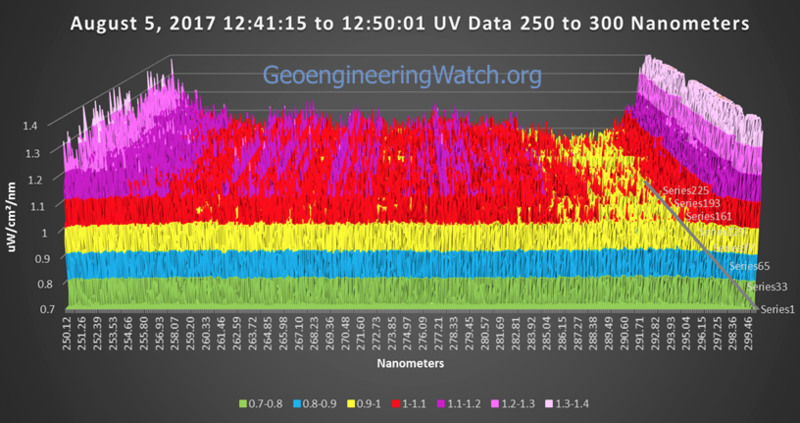 If it were not being blocked by the ozone layer, and if the oxygen was unable to block the much more blockable levels of UV-C below 250, then there would be vastly more UV between 250 and 300 than between 200 and 250. The are multiple other problems. Why are we not blind? Why has nobody noticed this unusual rise in UV. Why has nobody noticed thousands of tons of coal-fly ash being sprayed in the atmosphere. But these are almost irrelevant - the paper is fundamentally flawed and should never have been published. Let us not give it any more credence than it deserves. Fully agreeing with you there, Mick. That is probably for a metre or so, given the context, not the whole atmosphere. Exactly, if the UV starts get attenuated in few feet then it's not going to make it through thousands of feet of atmospheric oxygen. And of course the ozone layer is still there. It's being observed by hundreds of scientists all around the world. All has been said so far, but how could the paper have been accepted for publication? I cannot imagine the whole board reviewing the paper all agreed just like that? Should be retracted before long. Why would anyone try to publish such a spectacularly weird result without first confirming it with other measurement instruments/methods. Anyway, remarkable new findings, even if published in a renowned peer reviewed journal, are most likely just noise. Was this picked up by any mainstream media? It is unfortunate when that happens since it can undermine the public's confidence in the scientific process. Not until you have several independent teams coming to the same conclusion do you have a result. It is striking the group that made the findings, does not FIRST question their data, but directly concludes that it must be the light/atmosphere and not a faulty spectrometer and/or wrong measurement method. When there is huge "database" of measured spectral solar data, originating from many places on earth, measured with all kinds of different instruments, would it not be scientifically correct to doubt your strange findings? I agree that stray light is the most likely cause of their short wavelength values. I saw one comment speculating that the journal might retract the paper. As the senior author of the comment on the original D'Antoni paper (ref #28 in the Herndon paper), I naively thought that, by submitting that comment, the journal would think of retracting the paper. However, the editor was remarkably aloof and uninvolved in the controversy, and D'Antoni was permitted to publish a response to my comment (#29), and that was the end of things. The D'Antoni paper had been profiled by Nature Geosciences, and I couldn't get any response from them either. Any ideas how we should proceed with this paper? One other criticism of this paper is the photo of the tree in NYC. Classic "southwest winter injury." Ask a plant pathologist - I did. On a clear, cold winter day there is enough sunlight (very little UV) which thaws the vascular tissue just under the bark. Sun sets, goes behind a building, etc and the temperature drops quickly, refreezing the vascular tissue. Enough times during a winter and damage as seen in the picture results. That's why orchardists and horticulturalists paint trunks white or wrap them in white paper or perforated white plastic. I do that on my own fruit trees. Any ideas how we should proceed with this paper? Hopefully they would not charge a fee for a commentary paper. Wow, that's very interesting, and useful info. eg. figure 5 and figure 6. The absorption must increase towards shorter wavelengths until about 250nm. so there is no chance of the UVC at ground level increasing towards shorter wavelengths anywhere between 300nm. and 250nm. regardless of ozone concentration. One other criticism of this paper is the photo of the tree in NYC. Classic "southwest winter injury." Or given that it's in New York City, perhaps it's classic "bike lock injury". There's quite a few possible causes of tree injury. And here is a handy converter to atmospheric transmittance, just in case anybody thinks it is proportional.. Looks about right to me, but Mick, or others can check. Handy, but the transmittance of course depends on a lot more then only O3..
..but nothing attenuates quite like O3 between 300 and 250nm. I agree here. I was not specifically talking about UV, so both our statements hold. I found a great link explaining what I thought was indeed the case: the stray light on the ccd detector due to the compact design of the spectrometer. The link is from a competitor spectrometer company, but the specifications are the same: the Czerny-Turner Spectrograph. I used a similar one from OceanOptics, they are really great! But, when not aware of the limitations, it can cause errors. What happens is that the light from the grating, because it is a folded design, cannot be properly "baffled" to prevent stray light from hitting the detector. This is why compact spectrometers are more suitable for 400-1000nm. UV is tough. Another way to skin a cat. Don't know if, or how, they got it wrong as I can't see enough details. I have oak trees, and this morning it looked like one of them was on fire, with smoke pouring out of it. Of course it was just condensation, steam evaporating off the warming tree in the sunlight, and then condensing in the cold air, then evaporating again as it mixed more. We had a slight frost last night. You can quite easily understand how this cycle of freezing and sunlight can lead to injury on the sunward side. yup. wilt disease kinda looks like that. Looks remarkably like a dead tree. Taking a photograph of a street tree under such horrid planting conditions as some conclusive proof of anything other than tree stress (or already being dead) is ludicrous. Sorry, I missed this thread when posted. I work with ground and airborne spectal radiometers all the time. I think Mick got the correct answer at the opening of the thread. Measurements outside the reliable wavelength response of a sensor are suspect. The radiometer setup is also preposterous as it should be aimed at a flatfield reflectance target, e.g. a Spectralon plate. I tend to blame instrument companies that record data outside the region of good signal to noise (SNR) of detectors. I have seen this in long wave (FTIR) instruments that are good in the 9-14 micrometer range but provide measurements down to 2 micrometers wherein the measurements are meaningless using FTIR technology and SNR is in the single digits. I also noted that "sciencedomain.org" is listed in Bealls List of Predatory Journals and Publishers as a pay to publish online journal (https://beallslist.weebly.com/). I have been asked to peer review at some of these dubious journals in fields totally outside my core scientific knowledge.